Parker Shelton pretty much has the perfect life. She's on her way to becoming valedictorian at Hundred Oaks High, she's made the all-star softball team, and she has plenty of friends. Then her mother's scandal rocks their small town and suddenly no one will talk to her. So she quits softball. Drops twenty pounds. And she figures why kiss one guy when she can kiss three. Or four. 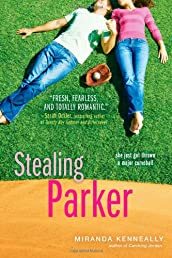 Why limit herself to high school boys when the majorly cute new baseball coach seems especially flirty?